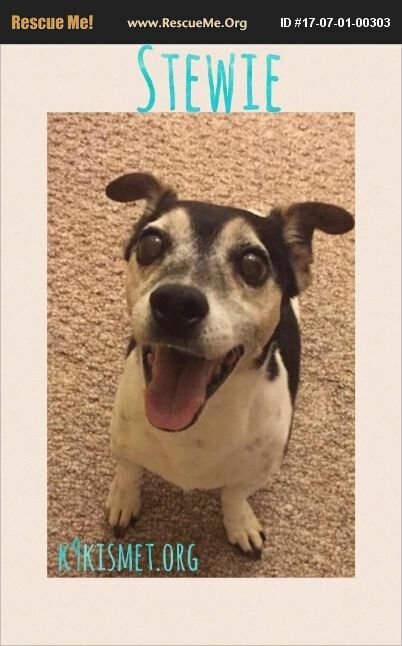 Stewie is a 13 lb Jack Russell Terrier, approximately 8-10 years old. He's housetrained and knows how to use a doggy door. Stewie is usually well behaved and obedient, understanding 'come,''sit,' 'no' and 'drop it' (tennis ball). He can be very high energy--in true Terrier fashion. He loves tennis balls and will bring the ball back to you when thrown, but he also loves to cuddle up next to you when the time is right. He's perfectly happy sleeping in his own doggy bed or next to you on yours. Stewie is good on leash but doesn't appreciate skateboards or bicycles whizzing by. He lives with another JRT mix whom he gets along with very well, yet doesn't care for dogs not in his pack when on leash. Stewie must be told to not chase cats, but is very polite when he knows the rules. Stewie is affectionate and will follow you back and forth from room to room. He is experiencing some separation anxiety that will hopefully resolve over time as his confidence builds. He'd be best in a home with people familiar with his breed characteristics and with at least another small dog and a someone who will play endless games of fetch and get him outside for regular walks around the neighborhood. He has thus far shown to be gentle around children. This little man has a lot of good years left in him!